New York City Family: Thought-You-Didn't-Need-a-Laminator Laminator Idea: Cute Name Tags/Gift Tags! Thought-You-Didn't-Need-a-Laminator Laminator Idea: Cute Name Tags/Gift Tags! I have a good time laminating. It's fun. Laminating makes things on paper feel more special and permanent. Before I had my very own laminator, Rob and I laminated some flash cards for Greyson at a local copy shop. And that was fine to go to a few blocks away to get something laminated. I just never would have thought to buy a laminating machine. We're not big on buying lots of stuff, especially appliances that take up space and aren't essential. 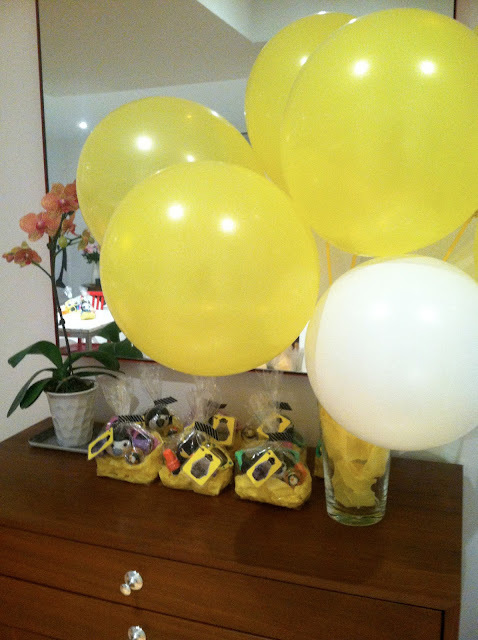 But, when my brother got me a laminating machine and a big box of laminating paper for my birthday, I was stoked! I was looking around my house for things to laminate, like a cheetah hunts for its prey. For our first project, Rob and I made little nametags that also served as gift tags for the kids who came to Greyson's birthday party. We thought the nametags would be good for lunch bags or boxes, scooters, backpacks and that sort of thing. 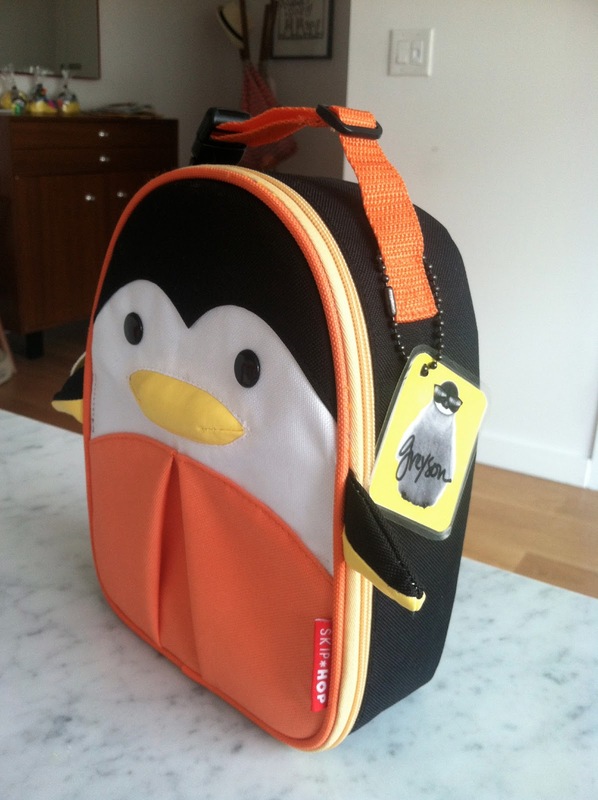 Greyson uses his on his cute, penguin-shaped insulated lunch bag that his friend Ivy gave him for his birthday. -First, we took the image that Rob designed for the birthday party invitation, printed many copies out small and cut them up into the individual sizes. 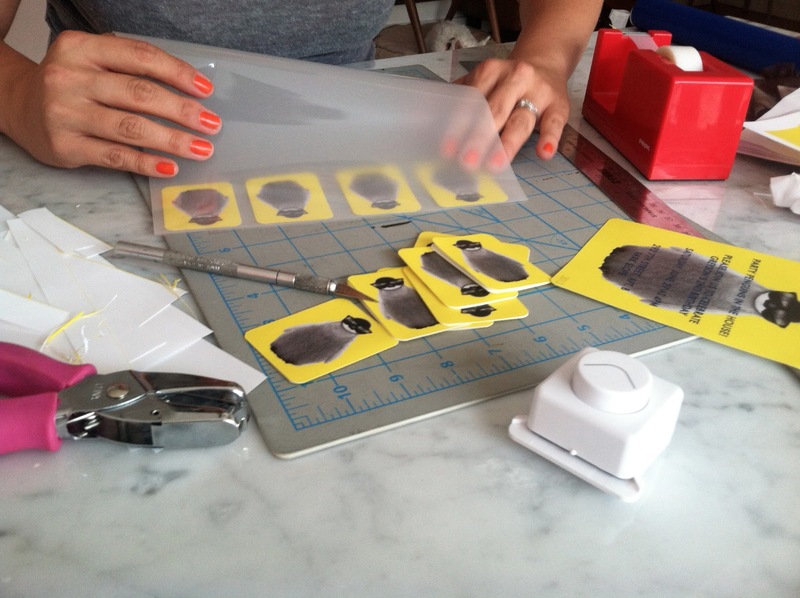 We used a corner rounder, (ours is this one from Muji, but it didn't work on the plastic well) which really helped a lot to make the tags look polished and professional. 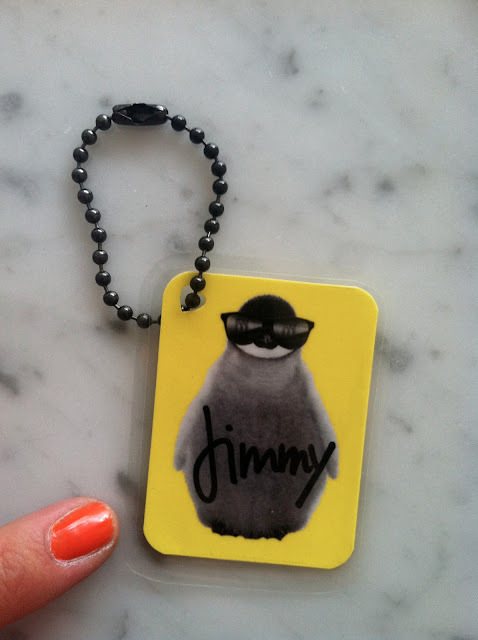 I also think that using one very graphic image on a bold color makes the tag look nice. 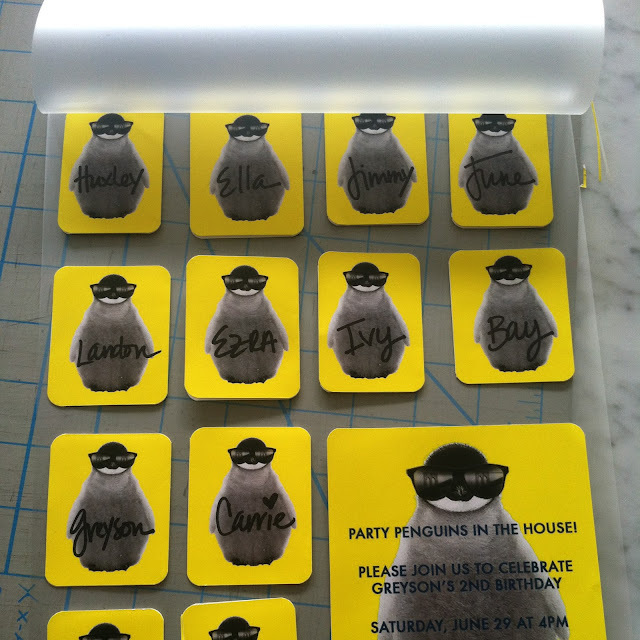 -We wrote the first names of the kids on each of the penguin labels. When Greyson goes to school this September, I'll probably add my phone number to some of his name tags, so that if his stuff gets lost, there's a chance we'll get it back. -We lined up all of the tags, making sure there was atleast 1/4" in between all of the tags, so the lamination seal wouldn't be broken. 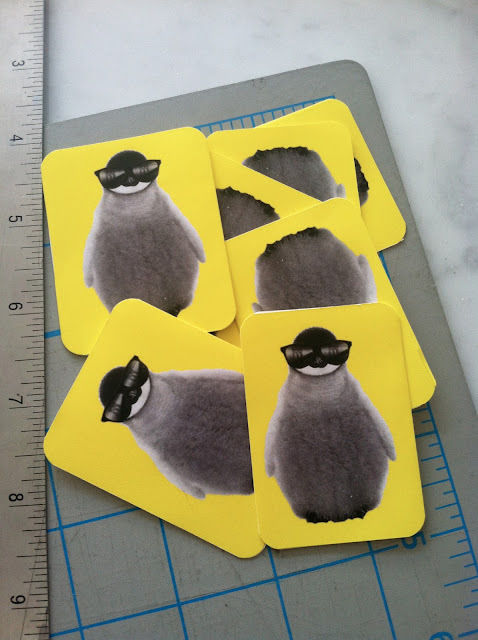 -We use scissors to cut the individual tags from the laminating sheet. Then we used the scissors to round the corners. -We used a heart-shaped hole punch in the corner and fed a ball chain through it. You can get ball chains on Amazon. I was very excited about how the tags turned out. I thought they were super cute. 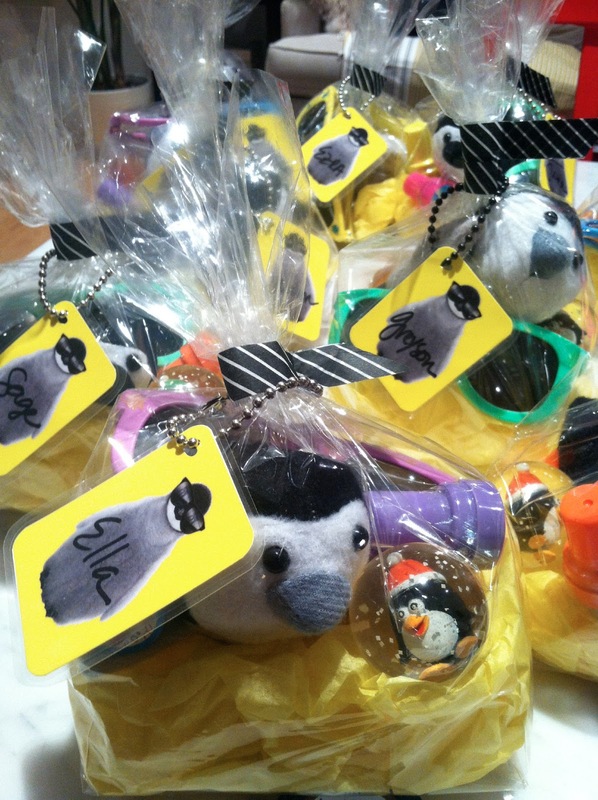 -We then used the tags on the favor bags for the kids who came to Greyson's birthday party. This is just the beginning of my laminating adventures, so get ready for more posts on how to seal fun things in between plastic sheets. If you have any fun ideas for things to laminate, please share them in the comments! You can laminate pictures from coloring books, and use white board erasable color markers for Greyson to color them, and erase them anytime. Great idea! I was thinking of just laminating paper, too, so Greyson can doodle at restaurants.